Chaos. Pure chaos. That is the only way I can describe 90% of my pet photo shoots. What can I say – I love dogs and I love a good challenge. I’ve been a professional pet photographer for 10 years and I still tell clients I’ve never met a dog I can’t photograph. What I really mean is – your pet may be the most stubborn dog on the planet, but I am definitely more stubborn and with the magic of digital artistry – no one (but us) will know your dog was a holy terror during their session. For example, I met with a client this past weekend. 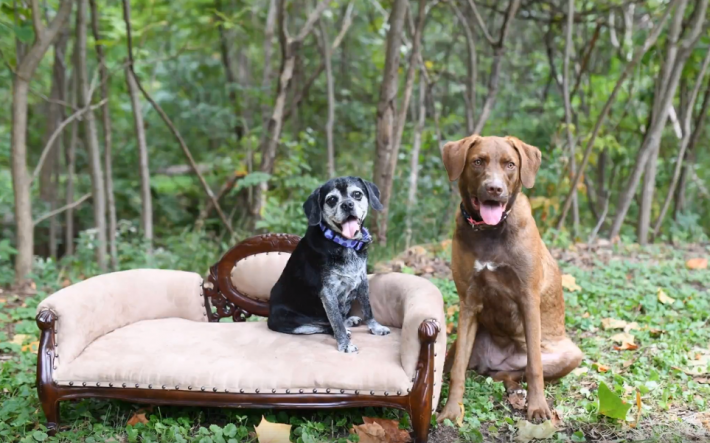 She brought her sweet senior pup and also their new addition – a 7-month old Chesapeake Bay Retriever. After about 30 minutes of Sadie refusing to sit and stay and dragging my pet sofa around in the dirt (while leashed to it), I started to wonder if I had met my match. She definitely tested my persistence, but I won. While this post is comical, it’s also meant to show potential clients what to expect. Do not be surprised if your session doesn’t go as planned. Even the most well-behaved and trained dogs have a way of letting a new park’s smells and surroundings get the best of them. Lucky for everyone, I have literally seen it all. I promise. If you are up for the challenge, then so am I! Shoot me a message at jennifer@fixyourimages.com to book your session. You can also read more details on FAQs here and Investment options.